At all levels, managers are often faced with managing ongoing operations while implementing new ideas for taking the organization to the next level of performance. These managers have staff who can manage ongoing operations, but unfortunately, staff are often not able to deliver the new initiatives – either because of a lack of time, or because launching new initiatives requires a different set of skills that they don’t have. Senior Officers, advising them as they visualize new initiatives, and being available to design and execute. You benefit from my uncompromising attention to detail: design details, communication details, logistics and infrastructure details. This focus provides for a seamless launch and efficient movement into program maintenance. It also makes the difference between new programs that look great in a binder but aren’t viable, and programs that have been thoroughly integrated into the organization. Given the changing needs of organizations, special projects regularly emerge needing attention. A transition may have special requirements, rising demand for services may require new tools that enable more efficient performance or an assessment of the organization may be needed to determine future organizational priorities. 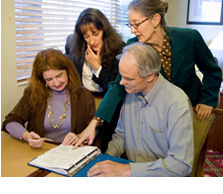 Nancy Dill Consulting is an experienced and highly skilled firm capable of meeting your specialized project needs. 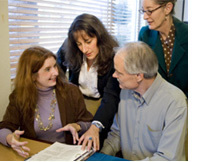 Nancy Dill Consulting offers customized training based on your needs. My perspective is that training design is comprehensive, although the responsibilities can be divided a number of ways. An outstanding design starts from understanding the organization: where it is today, what it needs, resources available to manage classroom logistics, etc. In order to be effective, corporate training needs to be highly engaging. When people are engaged, their minds open up. When they are in programs that offer them opportunities to apply the concepts, they incorporate the concepts as part of their thinking. Difficult concepts need to be shared in a non-threatening format that meets the needs of a broad spectrum of participants. The case studies below offer several examples of large scale training initiatives I have designed and managed. To learn more about how I achieve these results, read My Approach. To learn more about me, read About Me.